Indie star Shovel Knight is hot property, and it’s still showing no signs of cooling down. 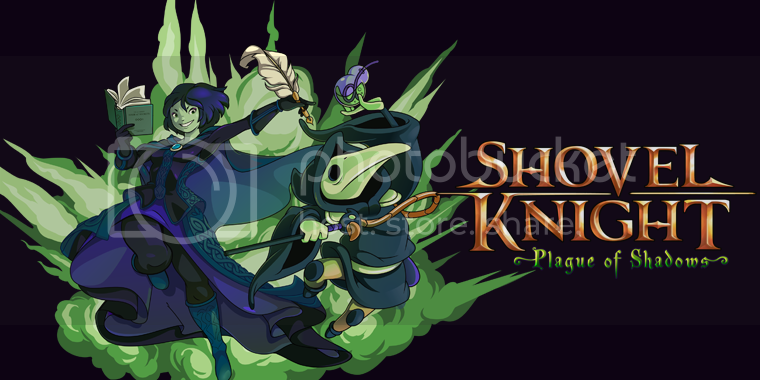 There was the recent news that there’s going to be a very cool-looking Shovel Knight Amiibo, and now everybody who owns the game can download the Plague of Shadows expansion for free. Yes, free, as in no money required to take ownership. As if that news wasn’t groovy enough on its own, there’s more. The Plague of Shadows soundtrack has been composed by the disgustingly talented Jake “virt” Kaufman. In fact you should totally follow him on Twitter, where he consistently shows himself to be interesting and witty (also, he talks about his dog a lot). If you thought it wasn’t possible for this soundtrack to be associated with any more awesomeness then you are very, very wrong. It’s currently up for download at Bandcamp – on a “pay what you want” basis. Fourteen tracks for whatever you think it’s worth, or for what little you can afford if you’re struggling for spare cash but are a fan of cool music. Of course, it’s also a great opportunity to pay an insultingly small amount if you’re rich and evil (like David Cameron or Donald Trump). Don’t do that.